Blade Length : 29.5", Blade Width. (Widest): 1.8" & Overall Length : 36"
includes a leather wrapped scabbard. the grip tightly, wrapped with black leather inset with spiraled steel wire. * * wood-core scabbard covered in brown leather with an integrated wooden suspension loop. We feature two versions, regular and fighting (light combat ready) models. Made of hand-forged EN 45 solid steel, this sword has a fullered blade and has a single tang. A leather wrapped hilt, with small wheel pommel, and hexagonal, slender, down curved quillions. It includes an authentic leathered scabbard. Specifications are: Blade Length : 29.5", Blade Width. (Widest): 1.8" & Overall Length : 36". We feature two versions, regular and fighting (light combat ready) models. Made of hand-forged EN 45 solid steel, this sword has a fullered blade and has a single tang, thick square-section downward pointing quillions, and semi-circular pommel It includes a leather cord wrapped scabbard blend of scent-stopper and semi-circular. Blade Length : 29.5", Blade Width. (Widest): 1.8" & Overall Length : 36". This is the regular model. Made of hand-forged EN 45 solid steel, this sword features a fullered blade, thick square-section downward pointing quillions, a blend of scent-stopper and semi-circular pommel. 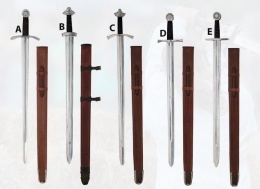 It includes an authentic leathered scabbard with steel tip detailing. This sword has two versions, regular and fighting (light combat ready) models. Made of hand-forged EN 45 solid steel, this sword features a fullered blade, straight cross-guard, and octagonal pommel. It includes a leather wrapped scabbard. This page was last modified on 14 June 2014, at 17:41.